A breath of fresh air perfectly describes Callum Brian, a newly constructed, 20-unit, luxury boutique condominium designed with European flair, inside and out, and must-have conveniences, such as an elevator and an attached, heated parking garage. 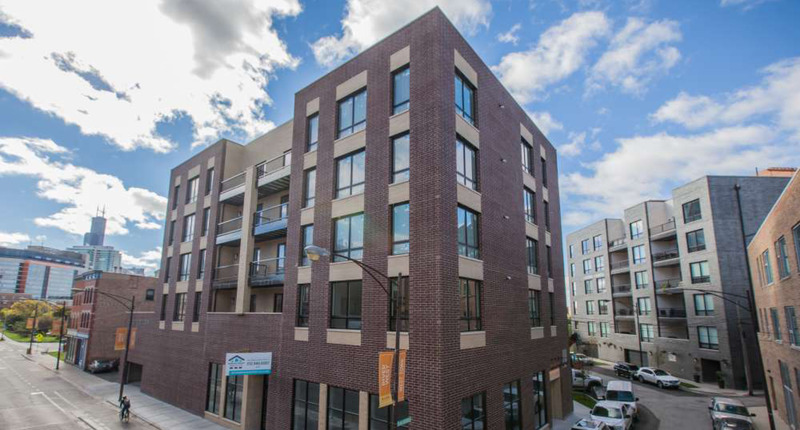 This “chic contemporary” six-story building at 680 N. Milwaukee Ave. in River West has a bright exterior, a sophisticated juxtaposition of burgundy and cream-colored brick to suit its prominent position on the block. Equally grand is its lobby, with sparkling chandeliers and ample seating. In close proximity to Fulton Market and the West Loop, Callum Brian is in walking distance to the Blue Line and minutes from the I-290 and I-90 entrance ramps. Delightful shopping, dining and entertainment options can also be found in the neighborhood. 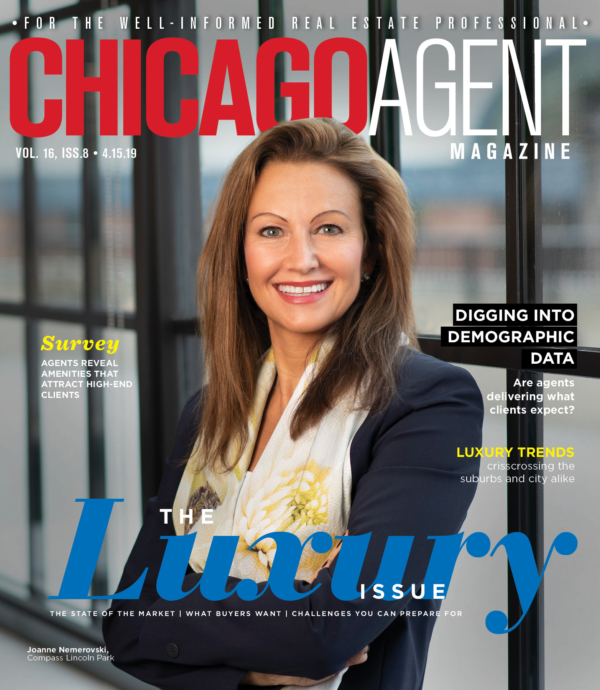 “Everything in the city is really at your fingertips,” says Jamie Arthurs, a broker with Domain Group Realty, LLC. 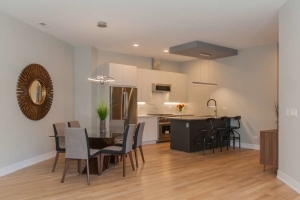 Callum Brian’s expansive three-bedroom, two-bath condos are priced from $639,900 to $830,000. 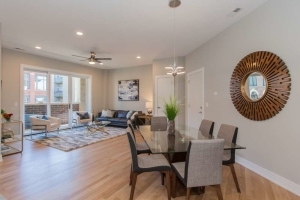 Penthouse units, which start at $790,000, come with two indoor parking spaces and a private rooftop deck with a pergola, perfect for entertaining guests or relaxing after a long day. “We’ve got a full 360-degree view from the rooftop, as far north as the lights of Wrigley Field at night and as far south as you want to see,” Paul says. “The eastern view of the city is phenomenal, and at nighttime, it’s just hypnotic.” All other units come with balconies that have plenty of space for a grill and table and chairs. The kitchen — with an island that opens to the living room — is equipped with all stainless steel appliances: a Bosch dishwasher, Wolf gas range, KitchenAid microwave and hood combo, and a Bosch refrigerator with French doors and double freezer. Luxury cabinets, quartz countertops with a finish so soft it feels like leather, and white oak flooring come together in sleek elegance. The master suite has an enormous walk-in closet and master bath with radiant-heated porcelain floors, walk-in shower with Grohe rainfall sprayer, and hand-held body mister. A second full bath — located near the two guest bedrooms for easy access — has an air tub and a shower. Floor-to-ceiling windows throughout the units let in natural light and magnificent displays of the city’s skyline. Soaring 9-foot-high ceilings give each home a more spacious feel. Soundproof materials between the floors and exterior and interior walls keep out noise from neighbors and the outdoors. All units are wired for surround sound and a thermostat that incorporates Alexa. “The entry system to the building is linked to every owner’s phone,” Paul says. “There are also cameras in the lobby to see who is at the door and talk to them.” Residents can allow visitors to enter by pressing a number on their telephone keypad.